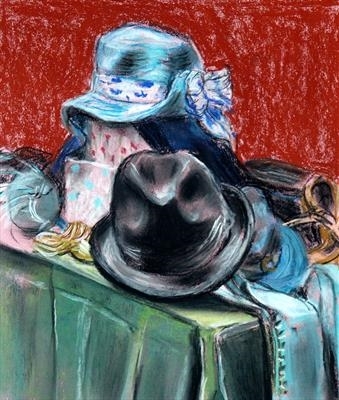 Pastel Painting of several hats, mens' and womens', on a table. I was always taught that it was rude to wear a hat indoors so set up this still life as a comment to thise who have not learned this courtesy. Also available as open edition Giclée print for £250 with certificate of authentication. This is a neo-impressionist pastel painting of several hats, mens' and womens', on a table. I was taught that it was rude to wear a hat indoors so set up this still life as a comment to those who have not learned this courtesy.